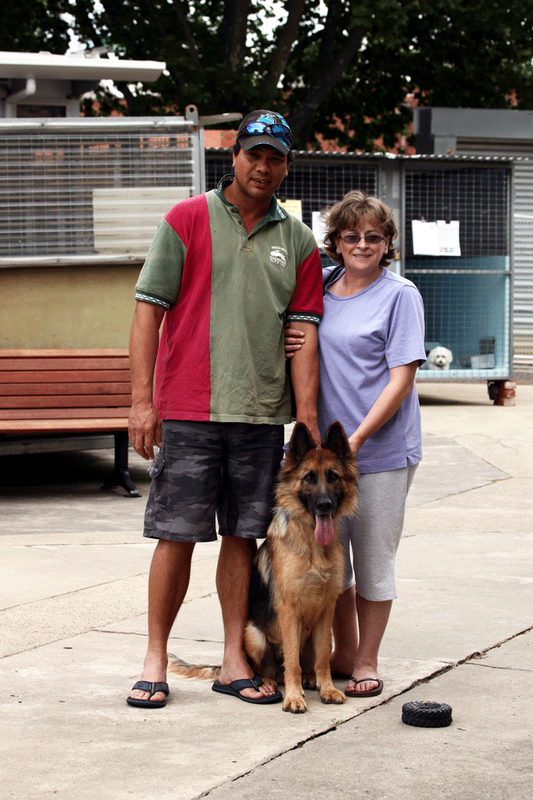 Four-year-old German shepherd Lily went missing from her home in Goulburn, NSW over seven months ago and today her owners drove 700 kilometres in seven hours to find her again. Owners Theresa and Tracker, and their kids Carly and Stuart, were absolutely devastated by the loss of their beloved pooch and said they were gobsmacked to find out she was at The Lost Dogs’ Home in North Melbourne. The couple suspect Lily was taken from their yard, as the heavy front gate – which had been locked the night previous – was unhinged when Tracker set off to work on the early May morning. Theresa said her son had snuck Lily up to his room during the evening before and let her out at 5.30am so his parents wouldn’t know she’d spent the night indoors. In roughly an hour timeframe, Lily was missing from their property. After speaking with staff at the Home on Sunday to make arrangements, Theresa and Tracker jumped in the car at midnight last night and drove over seven hours to North Melbourne. The reunion between the exuberant dog and her loving owners was certainly a joyful one – although it came with a surprise. Despite this, Theresa and Tracker said Lily looked the same as always and couldn’t wait to get her home to the kids. Lucky for Lily, nothing much will have changed at her home, with her owners saying they couldn’t bring themselves to throw her things out. National Pet Register Manager Kate Hoelter said this family’s story really highlights the importance of microchipping your pet and keeping the contact details up-to-date. Kate said although National Pet Register reunites around 24,000 pets with their owners every year, seeing the joy on both Lily and her owner’s faces when they were reunited was just wonderful.